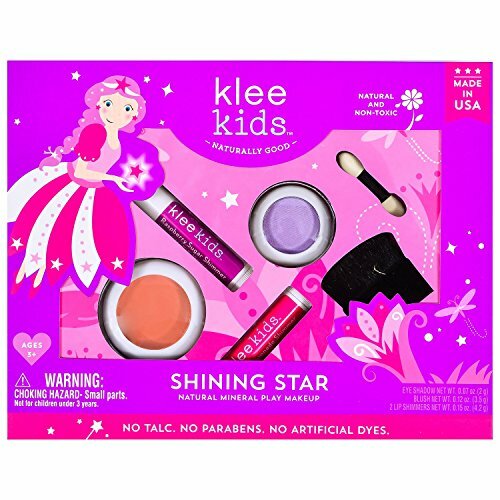 Pretend play can now be worry-free with Klee Kids Natural Mineral Play Makeup Collection, formulated with natural minerals and other wholesome, non-toxic ingredients. NO harsh chemicals. NO talc. NO artificial dyes. NO parabens. Gluten Free. Now, your little girl can stay out of your makeup bag and have her very own safe and natural makeup. The Shining Star kit contains Sparkle Purple eyeshadow, Pink blush, Raspberry Sugar lip shimmer and Pink Lemonade lip shimmer. Klee products are made lovingly in the USA.